Despite his family link with Erasmus Habermel, the instruments of Josua Habermel lack decorative sophistication and ingenuity. 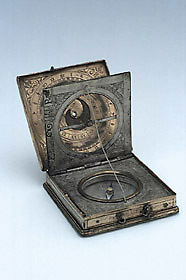 This compendium is of a standard pattern, and includes an equinoctial sundial, a horizontal string gnomon sundial, volvelles and latitude tables. It is now incomplete: the rotating discs of the volvelles are missing.